"Svara" is group in Lithuania, which performs Indian classical music and uses authentic musical instruments made in India.Ansamble first started to play Hindustani music in Lithuania.The name Svara means sound or notes in Sanskrit. Anatolij Lomonosov, founder of the group, plays sitar since 1981. In 1984 the group gave its first official concert in the House of Composers in Vilnius. In 1985 the group participated in a performance devoted to outstanding sitar player Ravi Shankar.In 1986 the group became a member of the Music Committee of the-then USSR-India society and actively participated in activities of Non-European music division at the Moscow Conservatoire, which was founded by famous professor J. K. Mikhailov. During India-USSR cultural festival which lasted one year, at the initiative of J.K. Mikhailov A. Lomonosov was invited to play with Ustad Imrat Khan, one of the most prominent world sitar players, and became his pupil. Lomonosov was granted scholarships by Open Society Fund and India, and in 1991 and 1997 took professional classes under guidance of Ustad Imrat Khan (Etawah Gharana) in Calcutta. During his stay in India he gave concerts with his teacher and performed by himself. The group gave concerts in Russia, Latvia, Estonia and Poland. Its music is used in soundtracks of such movies as The Ticket to Taj Mahal by Lithuanian film-maker A. Puipa and The Stone Carver by A. Maciulevicius. The group records its music in the state radio and television, it also cooperates with the Lithuanian State Youth Theater. Eirimas Velicka, folk music expert and author of music textbooks participates in concerts of Svara since 1995. Lomonosov also tried to make a synthesis of the Indian classics and Lithuanian folk music. In 1995, 1996 and 1998 Svara recorded tapes for its Indian Music series. 1995 master class with Fazal Quareshi(tabla) on Riga's conservatory. Video: Ahir Bhairav . Dueto concert with sarod player from Riga-Akash at the Riga Liuter church. Youtube video : Part 1,Part 2. In the end of 1998 A. Lomonosov and saxofonist Vytautas Labutis jazz trio experimented with modal jazz and traditional Indian music fusion. The resulting program was recorded and broadcasted by the Lithuanian National radio. In the beginning of 1999 A. Lomonosov joined forces with famous jazzman percussionist Arkadi Gotesman and Latvian dancer Arnis Silinch. Their performance was presented in March during the International New Baltic Dance festival in Vilnius. Other highlights of 1999 were Svara's concert at the Asia and Pacific Museum in Warshaw (Poland), Duet with Anindo Chaterjee, one of the best world tabla players, at the Riga Philharmonics Hall.Youtube video: Purija Kalyan(vilambit tintal) ,Puriya Kalyan (drut tintal) , Tabla solo-part 1 , Tabla solo: part 2 .And performances in front of the Lithuanian National Symphonic orchestra in Vilnius and Kaunas Philharmonics. A new World Jazz Fusion project "AnatoAli" featuring Lithuanian jazz stars Arkadi Gotesman (drums) and Leonid Shinkarenko (double bass) was presented in the house of German cultural attache in Lithuania on the 5th of February 2000 and repeated with Vitalij Logvinov (tabla) on 18th of October 2000 during the concert in Vilnius Russian Theatre. Vitalij Logvinov since 1999 became a pupil of famous tabla player Anindo Chaterjee.In 2001 there were many interesting events. Anatoli Lomonosov and Arkadi Gotesman took part in very prestigious Sergey Kuryokhin International Festival SKIF-5 in St. Petersburg. From 14th to 19th of May Svara participated Tartu Vanamusika (old music) Festival, where presented two original programs. The first one guested E. Velichka (violin, kankles,vocals) from Vilnius and A. Triumpel (tabla) from Riga, another featured Vasi Ahmed Khan (tabla) from India. Anatolij Lomonosov also played tampura with the Indian masters Mustafa Raza (vichitra vina) and Vasi Ahmed Khan (tabla). On 7th of July Svara performed at the KurKliosh Festival in Lithuania.In the end of the summer 2001 Svaros released their first CD "Journey To..." (KuKū Records). The album shows Svara experiments combining traditional Indian music with Lithuanian folklore and modern jazz. It features some of the most prominent Lithuanian folk and jazz musicians - Eirimas Velichka, Algirdas Klova, Vytautas Labutis, Leonid Shinkarenko and Gediminas Laurinavichius.Svara and L. Shinkarenko played at the Holistic Art Festival Oras in Šiauliai in 2002. The same program later was presented at the Vilnius Jazz Club. In February 2003 Svara played at the Warsaw Hatha Yoga Academy's Sadhu Cafe. In May A. Lomonosov performed with the son of Ustad Imrat Khan, famous sarodist Wajahat Khan's ensemble during "Alternatyva" festival in Vilnius Philharmonic. "Svara" started to perform with electronic musicians - in October they played with "Happyendless" DJ at the Terminal Club in Vilnius. Anatolij Lomonosov has made complete sound restoration and mastering for two archive albums - "Vospoi, vospoi, zhavoronocek" (Lithuanian Orthodox songs released by Naujoji Vilnia culture center) and Audrius Povilaitis and Veronika Vitaitė 1969-1976 piano recordings for Sutaras.Tartu University(Esonia) record library has accepted 20 restoration works of A.Lomonosov(arhiv Indian classical music).An article about Anatolij Lomonosov was included in Lithuanian Music Encyclopedia vol.2.On 21st of June 2004 Svara participated Indian classical music festival "Indian Night" in Riga Philharmonics Hall (Latvia). Svara performed with the musicians from Latvia, Estonia and India (Dr. Mustafa Raza-Vichitra Vina). On 4th of September Svara played a new program at the Jazz, Blues and World Music Festival "Jumbo" in Vilnius. On 29st of January 2005 Svara played at the Riga (Latvia) at the Vagner Hall with Sergey Ancupov and 30st joined at the Latvian State Theater of Drama with dancer Arnis Silinch. From February two young tabla players start to play in the Svara :Bernardas Janauskas and Egor Ovchinikoff . On 19st of June 2005 A.Lomonosov played(bass tampura) with Wajahat Khan(sarod)Trio in Kaunas(X Pažaislio Music Festival) and On 21st of June 2005 in Vilnius Philharmonic (Lithuania- Vilnius Festival 2005). 2006 9 of July ensemble play in Druskininkai -Chiurlionis festival program-. 2006 18 of december in Riga (Narayana gallery) Anatolij Lomonosov (sitar),Ritis Kamichaitis (tabla),Sergej Ancupov (sarod) play for Ustad Shahid Parwez. 2007 27 of march - Special concert for HE Anand Sharma (Minister of State for External Affairs of Respublic of India). Riga "Latviesu Biedribas nama".On 27-28 th. of November- participation in organization and performance on the music festival "Viliaus Orientas"2007 "
2008 Presence : 12 th of June -Vilnius Town Hall ,21 st of June-Festival "Days of capital" with Arnis Silinch-Joga dance Vilnius Music and Theatre Museum,16 th of July - "Tomas Mann Festival" -Nida with Zanetta Svobonaite-daf,9 th of August - " Baltic Sounds Festival" with Eirimas Velichka-violin,Kernave.22nd of August- Music Festival "Regeneratorius 08".On 20-22nd.of November- participation in organization and performance on the music festival "SurSadhana-2008"
Lecture -demonstrations at music school "Saraswati"( Riga). On 2nd-3rd of December - participation in organization and performance on the music festival "SurSadhana 2011". 2009 Concert at the Riga's Art Academy with V.Logvinov and A.Adlyte (2009.08.14).Vilnius Hollytherapy centre- 2009.09.20 with V.Logvinov and 2009.11.15 with R. Kamichaitis and Mindaugas (tabla players). 26 th of Januari.Saraswati Puja at music school "Saraswati" (Riga). 5 th of April concert in Klaipeda "Musical Theatre " . 19 th of April- " Days of Ustad Amjat Ali Khan "
Concert at music school "Saraswati" (Riga) with E.Samersovs -tabla. June 2 nd. Vilnius- Azia food festival clausing. 26 st. of August-concert in Moskow.At the Jurnalists House. Riga Philharmonics Hall (video: raag Abhogi ). 17 th of November - participation in organization and performance on the music festival "SurSadhana -2012" ( Vilnius) with tabla player Eduard Samersovs and dhrupad singer Ashish Sankrityayan. (raag Bageshree). 5th. of July -concert in Jurmala Theatre (Latvia) , 19 th. of October concert on "Audio gourmet" exhibition with tabla player E.Samersov . 9th.-10th. of November participation in organization and performance on music festival "SurSadhana 2013" with Irina Kushelevich and tabla player Sanju Sahaj. Guest of project Vytis Nivinskas- double bass. 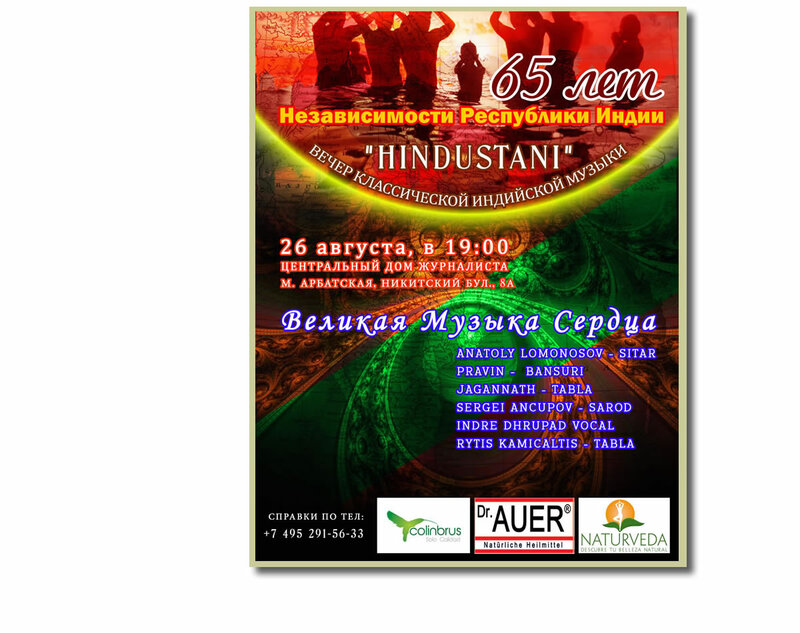 June of 6 th .Festival " Azian Days". Concert in Town Hall Sguare . 15th of November.Vilnius ''Mama Jazz" festival.Cooperation with Vladimir Tarasov "Lithuanian Art Orchestra". 21st -29th of November- participation in organization and performance on music festival "SurSadhana 2014"
14 th of September . Riga's promotion concert : "Ustad Amjad Ali Khan & sons in Riga "
5th -7th of November- participation in organization and performance on music festival "SurSadhana 2015 "
9th -12th of November- participation in organization and performance on music festival " SurSadhana 2016"
8th -11th of November- participation in organization and performance on music festival "SurSadhana 2017"